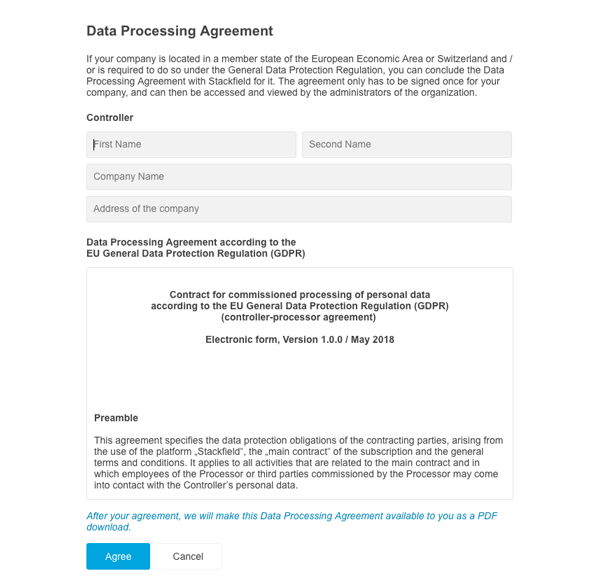 For a GDPR and data protection compliant use of Stackfield, the conclusion of a agreement for commissioned data processing with the Stackfield GmbH is necessary. That agreement only has to be concluded once per company. The person signing the agreement is the one who carries out the subsequent process. The conclusion of the data processing agreement (DPA) is possible directly in the settings of the organization for the administrators of it. 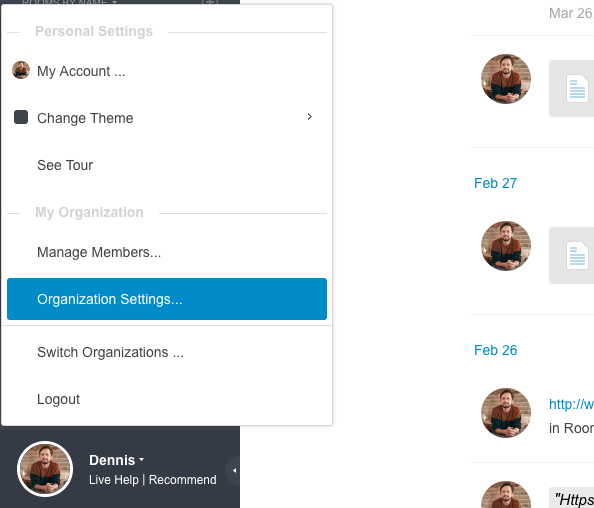 These settings can be accessed by clicking on your own profile picture in the lower left corner and then selecting the option "Organization settings". 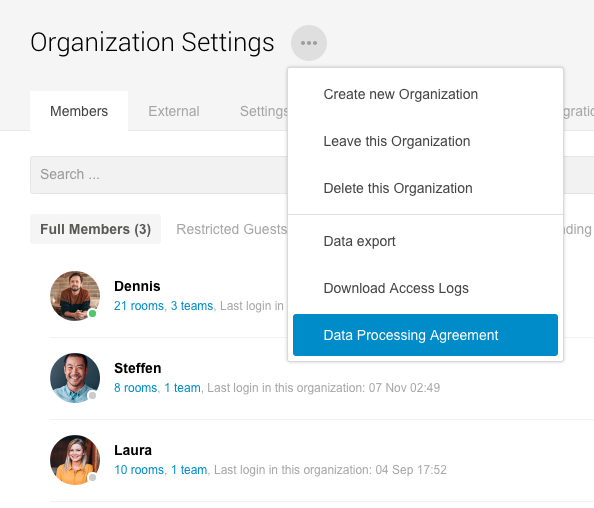 Within the organization's settings, there is a button next to the "Organization Settings" heading, represented by three dots in a circle containing the "Data Processing Agreement" option. 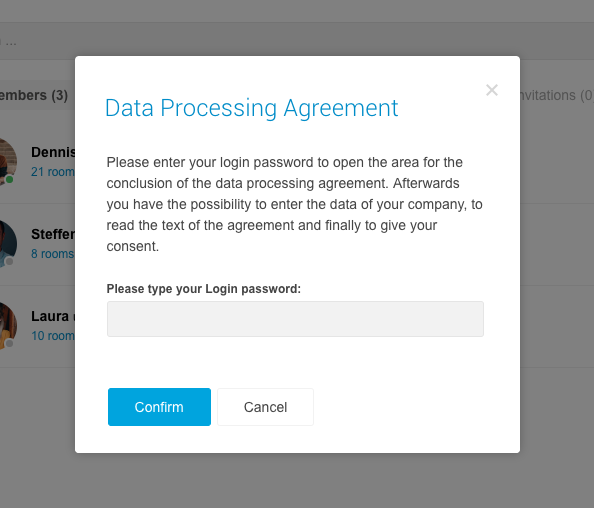 After choosing up the option "Data Processing Agreement", a password prompt will appear asking for verification of the logged in account. After the successful entry of the password, a forwarding into the area for the conclusion of the contract takes place. The agreement is not concluded by entering the password - another step is needed! Subsequently, the area for the conclusion of the contract opens. At the very top the data of the enterprise (Controller) can be entered. Once the text of the contract has been thoroughly studied, you can click on "Agree" at the bottom to conclude the contract. After a successful agreement, the "signed" contract will be made available as a PDF download. All other administrators can then also view and download the contract. The conclusion is only possible once per organization. Should changes to the company's data be necessary, our support is always happy to help!